They call this prefabricated item a shelf on wheels. 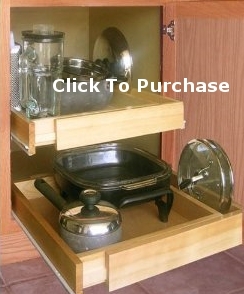 They are already assembled, adjustable drawers for your kitchen base or pantry cabinets. To install the shelves, you will need to possess some basic handyman skills and at the very least a Phillips Screwdriver and a tape measure. The kitchen cabinet shelves are made twenty inches deep, but are expandable in the width. The front of the drawer slides get screwed to the cabinet sides. The rear of the prefabricated expandable shelf unit fastens to the back of the cabinet. What is the expandable width range? The roll-out shelves have a minimum size of eleven and a half inches (11-1/2″) that will adjust to a maximum width of nineteen and a half inches (19-1/2″) wide. What is the height of the real wood pull-out shelves? These pre-made kitchen cabinet drawers have a fixed height of two and three quarters inches (2-3/4″). The description of the product would lead one to think that they are easy to install. All that is required to fasten the adjustable pull-out drawers into the base cabinet are eight screws per roll-out shelf. As a professional cabinet maker, what’s your opinion about how easy the prefabricated kitchen drawers are to install? I’d say that every situation is going to present challenges. How easy the shelves are to install is going to be largely determined by the type of cabinet they are being installed in and the homeowners level of skill. Approaching this type of project with the proper mindset is the key to your success. Is this a good price for an expandable pull-out shelf? Yes, this is an excellent price for an all natural wood drawer that is adjustable. Looking forward, what problems would someone incur during the installation of the adjustable roll-outs? The only problem someone may run into is the drawer clearing the hinges on the door. This is where the type of cabinet plays a major role in how easy these pull-out shelves are to install. If you are dealing with a “true” European style cabinet, you are going to need spacer blocks to ensure that the drawers don’t hit the hinges. In one of the reviews I read about expandable roll-out drawers, they said the item came with extra pieces of wood. I am certain that those were spacers to ensure that the pull-out shelf would clear the hinges if they needed to be installed. Of the reviews about these prefabricated pull-out shelves for kitchen cabinets that I read, the majority of the product’s users had good things to say about these prefabricated shelves. The recurring comment I noticed was that people referenced the importance of having a low level of “do it yourself” (DIY) skill. Just so you know, I’d charge upwards of eighty dollars an hour to install something like this for a customer. By the time you add in travel time, it would be an expensive project to hire an experienced cabinetry professional. This type of project is something that most people can do themselves in order to save a lot of money. All-in-all, I personally think that this is an outstanding idea for improving your kitchen pantry or base cabinets. This prefab, expandable roll-out shelf product for kitchen or bathroom base cabinets is well-built and reasonably priced. From all appearances this is a quality product. I think the key to any one’s success with this sort of thing is approaching it with the mindset that there will be a learning curve involved. To expect that this is going to be a simple task is not looking at the reality of DIY work on your home. If you decide to just enjoy your home improvement project no matter what, then adding these adjustable pull-out kitchen cabinet shelves to your pantry or base cabinet will be very rewarding in the end. Sliding shelves add a level of convenience that can only be appreciated once they have been experienced.